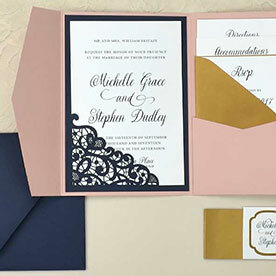 Photo features: Cipria Signature Plus Pocket, Imperial Blue A+ Pattern Lined Envelope, Imperial Blue 5 1/4 x 7 1/4 Mat, and Antique Gold A2 Envelope. Looking for a Matching Pocket? Edit your design and use the download button at the bottom of the page to print at home. We can also print your design for you. We're known for having the best quality at the best prices. Find more details in the "Printing" tab. Please note: Some customers are experiencing issues with these free templates. Our website team is currently aware of the issue and is working towards resolving it. Please try back soon if you are having the same troubles. Thank you for your patience. 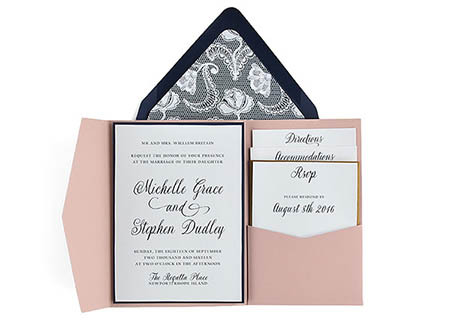 Are you considering having your invitations pre-printed? 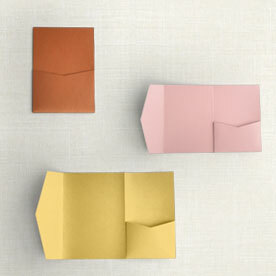 Our printing, our paper quality, and our prices are amazing. Your invitations will arrive professionally cut and wrapped. We usually ship these orders within two days, and shipping is free on orders over $130.00. Want just the invite printed?